We suggest you first read "Big Bang Cosmology, Supernatural Beliefs and Suppression of Evidence" (see here) as it will help you to appreciate the contents of this article a lot more. Cosmology (study of the origins and destination of the universe) proceeds upon a philosophical doctrine known today as "the Copernican Principle," an extension of which is "the Cosmological Principle" (a generalization of the first). The first states that the Earth does not have any special, privileged place in the universe and the second states that no matter where you are in the universe, everything will appear the same on large scales. There is no special location or place. It states that the universe is isotropic and homogeneous (looks the same in all directions no matter where you are). These are philosophical assertions in the framework of which scientific findings are defined and explained. In reality these assertions are a manifestation of arrogance through which the privilege of life on Earth is rejected. The aim behind these assertions is to steer all knowledge towards a naturalist religion. The entire enterprise must start with the assertion that Earth is in no special location and does not have any special privilege. Ironically, atheists say it is arrogance to claim special privilege and it is from humility to deny it! This clashes with what the revealed books came with, that the Earth occupies a special place and is privileged, a matter that is known intuitively, perceptively and rationally even without revealed text. People need to be aware that there is a range of models that could explain the observations... For instance, I can construct you a spherically symmetrical universe with Earth at its center, and you cannot disprove it based on observations... You can only exclude it on philosophical grounds... What I want to bring into the open is the fact that we are using philosophical criteria in choosing our models. A lot of cosmology tries to hide that. Both George Ellis and Stephen Hawking wrote in The Large Scale Structure of Space-Time (p. 34) "We [i.e. scientists] are not able to make cosmological models without some admixture of ideology". Keep these quotes in mind as you read ahead. Many decades ago the cosmic microwave background (CMB) was detected in space and it was argued that if these philosophical assertions are correct and if the "big bang" model is correct, there should be uniform presence of the CMB across the universe as a whole. There should not be any patchiness and certainly no variations in the CMB in the large scale of the universe. To test and confirm this, numerous satellites were launched over the past three decades and they are COBE (1989), WMAP (2001) and PLANCK (2009). COBE revealed that the universe is not uniform as predicted in the big bang model and as required by the Copernican and Cosmological principles. In fact it showed that the universe seems to have an alignment that points directly to the axis of the earth across its equator. To make sure they had things right, a more powerful satellite (WMAP) was sent up in 2001 whose data was processed in 2004 and it actually confirmed what COBE had indicated. A new term was coined "the axis of evil" and you have to understand the psychology here, it shows that scientists are not as impartial as you might think. When empirical observational evidence suggests the earth is at the center of the universe, it is considered "evil." To make absolutely sure there were no errors in the instrumentation, and in the collection of the data another satellite was sent up in 2009, the PLANCK satellite which was ten times more powerful than WMAP and all possible errors were accounted for in the design of this new more powerful satellite. Now before we look at the results, lets go and look what Lawrence Krauss (a theoretical physicist and vocal atheist) said back in 2006 about the data available for that time (from COBE and WMAP). But when you look at CMB map, you also see that the structure that is observed, is in fact, in a weird way, correlated with the plane of the earth around the sun. Is this Copernicus coming back to haunt us? That's crazy. We're looking out at the whole universe. There's no way there should be a correlation of structure with our motion of the earth around the sun - the plane of the earth around the sun - the ecliptic. That would say we are truly the center of the universe. The new results are either telling us that all of science is wrong and we're the center of the universe, or maybe the data is (s)imply incorrect, or maybe it's telling us there's something weird about the microwave background results and that maybe, maybe there's something wrong with our theories on the larger scales. He is stating explicitly that the data from the COBE and WMAP satellites puts the Earth in or very close to the centre of the universe. He say's "that's crazy," meaning that empirical observational data is crazy (because it does not fit in with his philosophical beliefs). He also says, "There's no way there should be a correlation of structure..." How does he know there is no way for a correlation to exist (sorry, forgot, it's because he holds philosophical beliefs telling him there can't be any correlations). And in any case, isn't the empirical data supposed to be speaking? He suggests the data maybe wrong but also admits the theories about the larger scales of the universe might be wrong. You can see the psychology going on here and you would do good to read about the two different definitions of science that are in play amongst naturalists and materialists (in this article). Before we cite the coverage in the media and journals of the Planck data and its implications it is important to bear in mind that when an entire paradigm is essentially falsified by observable, empirical evidence then the public has to be told things in a certain way so as not to reveal the true and real ramifications of what has been discovered. We will see some of the clever methods used in presenting the results of the PLANCK satellite data to the public in a short while. WHAT would you do if you found a mysterious and controversial pattern in the radiation left over from the big bang? In 2005, Kate Land and Joyo Magueijo at Imperial College London faced just such a conundrum. What they did next was a PR master stroke: they called their discovery the cosmic "axis of evil". What exactly had they seen? Instead of finding hot and cold spots randomly spattered across the sky as they expected, the pair's analysis showed that the spots in the cosmic microwave background (CMB) appeared to be aligned in one particular direction through space. The apparent alignment is "evil" because it undermines what we thought we knew about the early universe. Modern cosmology is built on the assumption that the universe is essentially the same in whichever direction we look. If the cosmic radiation has a preferred direction, that assumption may have to go - along with our best theories about cosmic history. Nobody knows for sure. We are dealing with the limits of our capabilities, says Michael Longo of the University of Michigan in Ann Arbor. "All observations beyond our galaxy are obscured by the disc of the Milky Way," he points out, so we need to be careful how we interpret them. The European Space Agency's recently launched Planck space telescope might settle the issue when it makes the most sensitive maps yet of the CMB. Until then, the axis of evil continues to terrorise us. Note "the axis of evil" might "terrorise us." Why is that? Should observational empirical data terrorise a scientist if the very definition of science is to let the observational empirical data speak for itself? Keep in mind the psychology going on here and recall the statement of George Ellis mentioned earlier. Planck confirmed what was indicated by the COBE and WMAP satellites. Various quotes will be presented below (some of which are technical) but the general meaning of them all is that the observational evidence shows the Earth to be at or very close to the centre of the universe and that there is a clear pattern in the universe which, through many different ways, points back to the Earth and its axis about the equator as a central location. It was made sure with the PLANCK satellite that all possible errors and miscalculations have been accounted for, so this is final, there is no doubt in these results and they have now been verified twice over with increasing levels of accuracy and sophistication. 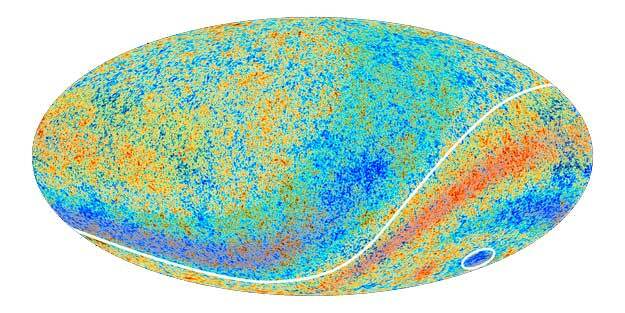 Two CMB anomalous features hinted at by Planck's predecessor, NASA's WMAP, are confirmed in the new high-precision data. One is an asymmetry in the average temperatures on opposite hemispheres of the sky (indicated by the curved line), with slightly higher average temperatures in the southern ecliptic hemisphere and slightly lower average temperatures in the northern ecliptic hemisphere. This runs counter to the prediction made by the standard model that the Universe should be broadly similar in any direction we look. Acquired by ESA's Planck space telescope, the most detailed map ever created of the cosmic microwave background - the relic radiation from the Big Bang - was released today revealing the existence of features that challenge the foundations of our current understanding of the Universe. That should read "...invalidate the foundations of our current understanding of the Universe" since the Copernican and Cosmological principles have been invalidated by observational, empirical evidence. Overall, the information extracted from Planck's new map provides an excellent confirmation of the standard model of cosmology at an unprecedented accuracy, setting a new benchmark in our manifest of the contents of the Universe. But because precision of Planck's map is so high, it also made it possible to reveal some peculiar unexplained features that may well require new physics to be understood. The reader should note that "the standard model of cosmology" which as it stands is referred to as the lambda cold-dark matter big bang inflationary model is a model invoking supernatural entities to keep it afloat. The "peculiar unexplained features" refer to numerous patterns that point directly back to the Earth, thereby invalidating the Cosmological principle. Now, what do they suggest in light of these "anomalies"? They suggest a new physics should be invented! Yes, when observational, empirical data does not fit your theory, invent a new set of maths equations and theoretical physics to make sure it does. You can see here the games that are played in science. It is not possible to separate ideology from science, despite what these atheists claim. "The fact that Planck has made such a significant detection of these anomalies erases any doubts about their reality; it can no longer be said that they are artefacts of the measurements. They are real and we have to look for a credible explanation," says Paolo Natoli of the University of Ferrara, Italy. "Imagine investigating the foundations of a house and finding that parts of them are weak. You might not know whether the weaknesses will eventually topple the house, but you'd probably start looking for ways to reinforce it pretty quickly all the same," adds Francois Bouchet of the Institut d'Astrophysique de Paris. In other words, we have to stop the house of cards from toppling over, by reinforcing it quickly. What does that mean? Well the Cosmological principle has been dealt a possibly fatal blow, so how can we give it some band aid and get it back on its feet? Invent a new physics to creatively patch the theory with the anomalies so our model remains intact. There are numerous papers on the subject that were published following the WMAP data and the PLANCK data, and we present a small selection below. They are technical papers and in short what they are establishing is that there are dipole, quadropole and octopole symmetries that point back to the axis of the earth about its equator and these are very highly unlikely. This puts the Earth at the centre and thereby clashes with the cosmological principle. Now some of these people don't like this result and try to offer certain suggestions or solutions which would be a natural reaction to expect of course. Is there a violation of the Copernican principle in radio sky? At the present time in cosmology there are no compelling alternative models that can account for the anomalies. (iii) the area vectors lie near each other, near the Ecliptic plane, and also near the dipole direction. ...We can only conclude that (i) we don't live in a standard ΛCDM Universe with a standard inflationary early history; (ii) we live in an extremely anomalous realization of that cosmology; (iii) there is a major error in the observations of both COBE and WMAP; or (iv) there is a major error in the reduction to maps performed by both COBE and WMAP. Whichever of these is correct, inferences from the large-angle data about precise values of the parameters of the standard cosmological model should be regarded with particular skepticism. ...On the largest angular scales the microwave sky is inconsistent with theoretical expectations These discrepancies between observations and theory remains an open problem. In the future, combining the current data with new information, such as new data from WMAP, observations from the Planck experiment, and polarization information (Dvorkin et al. 2008) may be key to determining the nature of the large-scale anomalies. You should not miss the 4 options that these researchers (who have extensive prior research in this field) have presented in light of the PLANCK findings. They are: 1) The current model (cold-dark matter inflationary big bang) is false. 2) Or it is true but there is something totally weird about the universe it has produced, it just does not make sense! 3) The observational data is wrong. 4) The processing of the data is wrong. Now options 3) and 4) have been invalidated and falsified. The data is correct and valid. Which only leaves the first two options. 1) The current model is false (and there goes the Copernican and Cosmological principles) or 2) the observed universe is not showing what the model expects it to be and is therefore behaving badly. This is just a way of trying your best not to admit the first option, that the actual model is wrong. There now exist many independent observations which indicate a preferred direction pointing roughly towards Virgo. It is unlikely that all of them can be explained by some systematic effect. For example, the NVSS data is more likely to pick a preferred axis pointing towards the poles due to systematic effect arising due to sources with low flux (Blake & Wall 2002). The direction observed, however, is nearly perpendicular to that. The dependence of direction with the cut on flux density might be explained by this systematic effect. This is consistent with our observation that the direction parameters are stable for the case of flux weighted (Kothari et al. 2013) and polarization flux weighted number counts. Furthermore it seems very unlikely that systematic effects would pick the same direction in so many different observations, i.e. radio polarizations orientations (Jain & Ralston 1999), optical polarizations (Hutsem ́ekers 1998), CMBR quadrupole and octopole (de Oliveira-Costa et al. 2004), radio number counts (Blake & Wall 2002; Singal 2011) and radio polarization flux (present work). In all likelihood this alignment of axes (Ralston & Jain 2004) is caused by a physical effect. There are many more papers discussing this issue, we don't have time to cite them all, these are only a quick sample. The point here is that the Copernical and Cosmological principles have been undermined by observational and empirical data and this also brings into question the model (cold-dark matter inflationary big bang) to such a degree that cosmologists are speaking of inventing a new physics just to deal with the anomalies, rather than admit the model is false. This is what you call superstitious, religious dogma that flies in the face of facts. Besides the evidence from CMB there are numerous other lines of evidence that validate the presence of the "axis of evil" and they also indicate a preferred position for the Earth. They include galaxy rotation alignments (see this article which explains that galaxies spin a different direction based on which hemisphere of the universe they are in, suggesting that the entire universe itself might be in rotation), the distribution pattern of quasars, the pattern of acceleration of certain types of supernova (see here) whose data "...does not exclude the possibility of ruling out the Cosmological Principle - and cosmological constant - hypotheses" (see here), and the quantization of galaxy clusters around the Earth which means that galaxies seem to appear in concentric circles separated uniformly from each other (sample papers: here and here). All these lines of evidence together invalidate the Copernican and Cosmological principles. Recently, the new release of the Planck observations on the CMB temperature anisotropy confirmed the alignment of the CMB quadrupole and octupole. And this particular direction is nearly aligned with CMB kinematic dipole direction. At the same time, the discontinuous distribution of power in the hemispheres on the sky was also been confirmed. All these show that we have the evidence for a break in isotropy. In order to solve these problems, a phenomenological dipole modulation may be needed. Since all these directional anomalies, as well as the alignment problems of the cosmic acceleration anisotropy discussed in this paper, the parity asymmetry of CMB power spectrum, the large-scale velocity flows and the large scale alignment in the QSO optical polarization data are connected with the CMB kinematic dipole and/or the ecliptic plane. We expect a single dipole modulation mechanism could solve all these puzzles. Several works have suggested that this kind of modulation could be caused by the non-trivial topology of the Universe, such as the anisotropic global Bianchi VIIh geometry, the Randers-Finsler geometry, or the multi-stream inflation. In other words, the proposed solutions to these anomalies have to be kept within the framework of the current model (must be of cosmological origin) and therefore will not be able to explain the alignment. Hence, because these explanations fail within the framework of the currently accepted model, we would rather believe the observational data and analysis is wrong! And you thought science was letting the data do the talking. No, its letting the hypothesis do the talking and the walking, while the data is gagged and chained, so no talking and no walking from the multiple streams of data! This is merely an illustration that science overwhelmingly is one of taqleed (blind-following), and scientific enquiry is largely determined by money. To receive grants and funding a certain paradigm has to be followed and thus careers and livelihood depend upon subservience to that paradigm. If you go against it with observational empirical data in your hands, you will suffer the consequences, no job, no career. This brief article does not really do justice to the topic as there is a lot more that can be written, discussed and pursued as a matter of inquiry. However, in short, numerous lines of evidence (empirical, observational) have invalidated the Cosmolological principle which underlies the naturalist religion and evidence indicates that the earth has a privileged position in the universe, a central location in fact. The implications of these lines of evidence are not readily and frankly communicated to the public but are obscured and hidden whilst claims are made that the current model is largely supported, a false claim since inflation, dark matter and dark energy are invented theoretical constructs used give life support to the model. Most people will not understand the technical jargon or the real implications of what is being discovered which allows the scientists to continue invoking supernatural entities and processes (or inventing new physics) to keep their current paradigm from crumbling. A word should be said about Muslim apologists who selectively take from the scientists what they think can be reconciled with the revealed texts when in reality, they distort the revealed texts and impose meanings upon them that they do not bear. These people find utility in the flawed big bang model of the universe because it implies a beginning and hence it can be incorporated into a flawed, corrupt argument known as the kalam cosmological argument. The common element between both the big bang model and the kalam cosmological argument is that they both assert time, matter and space were created at the big bang (the beginning). This is futile and opposes revealed text. Rather, measurement of time, created matter and space were already in existence prior to this universe. An existing order with physical laws was already present. This is indicated in the revealed texts (in the Qur'an and the Sunnah). When taken to its full logical conclusion, the corrupt kalam argument proves that it is impossible for "an act of creation" to have taken place (by the very premises and assumptions made in the argument) and that the universe is in fact eternal. These debates took place centuries ago when Philosophers saw the flaws in this argument and they continue to be pointed out today by shrewd atheists. Written by Abū ʿIyād on 20/01/1435H (24/11/2013CE).